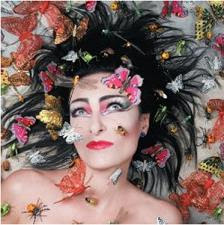 Siouxsie Sioux's first solo album, Mantaray, will be released on September 10 in the U.K., and one week later on September 18 in the U.S. The 10-track album will be preceded by a single "Into a Swan" on August 13. Siouxsie formed Siouxsie and the Banshees with fellow Bromley Contingent member Steven Severin in 1976. They were one of the most successful, groundbreaking post-punk new wave bands. Siouxsie took the top award at the MOJO HONOURS LIST in 2005, winning the Icon Award at the ceremony. Staged by British magazine MOJO, the HONOURS LIST honours veteran stars who have influenced contemporary music artists.